The seventh round of Syria peace talks held in Geneva ended in a stand-still, with UN Syria envoy Staffan de Mistura describing the process as having “no breakthrough, no breakdown.” He added that the Syrian government is still unwilling to discuss political transition, with Syrian President Bashar al-Assad’s representatives continuing their focus on the “fight against terrorism.” Syria’s main opposition group, which believes that the end of “terrorism” would not be possible without stability in Syria, has failed to put the peace talks’ spotlight on political transition in Syria. At the same time, France has asked major powers involved in the Syrian crisis to join a contact group that would make proposals to warring parties in order to break a deadlock in political negotiations, the French foreign minister said. France’s policy on Syria has changed recently, as President Emmanuel Macron no longer sees Bashar al-Assad’s step down as a precondition for talks, despite other French officials insisting he cannot be involved in the Syrian government long-term. “Mr. Macron knows well that Bashar al-Assad is the enemy of the Syrian people, but he at the same time is also the enemy of humanity. We cannot ignore a criminal like Assad who used chemical weapons on civilians,” said Nasser al-Hariri, the lead opposition negotiator. Meanwhile, fierce fighting between US-backed forces and the Islamic State (ISIL) has continued in Raqqa this past week, as ISIL has continued defending its stronghold in the city. 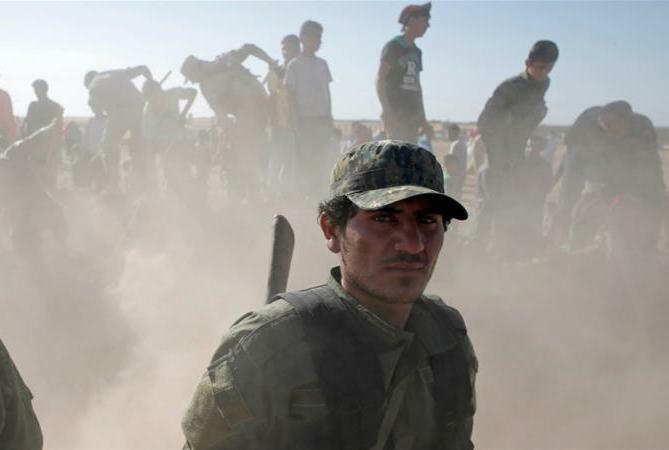 According to the Syrian Observatory Observatory for Human Rights, an estimated 35 percent of Raqqa is now under the US-backed Syrian Democratic Forces’ (SDF) control. Observatory director Rami Abdel Rahman stated that a steady stream of civilians have been fleeing ISIL-held districts, adding that “whenever there is a lull in the fighting, they leave towards areas held by the SDF.” For its part, the SDF said on its social media accounts that its forces “managed to free about 500 civilians who were trapped inside the Al-Daraiya and Al-Tayar neighborhoods, as well as 150 others from the Old City.” The UN estimates that up to 50,000 civilians remain trapped inside the city, down from around 100,000 people estimated at the end of June. Around 75,000 Rohingya have fled Rakhine to Bangladesh since the beginning of the military’s operation, according to UN estimates. The United Nations Human Rights Council has planned to send a fact-finding mission to Burma, but the country’s de facto leader Aung San Suu Kyi has refused to issue visas to the UN team. The refusal amounts to “a slap in the face to victims who suffered grave human rights violations by Myanmar’s state security forces,” said John Fisher, an ICRtoP member Human Rights Watch representative in Geneva. Fisher further implied that “it would be a travesty” for Burma to block independent international investigators. On Monday, 17 July, the UN envoy for Iraq Jan Kubis expressed concerns about the rise of revenge attacks in Mosul against civilians who are believed to be linked to Islamic State (ISIL) militants. After the liberation of the city, civilians who are seen as having ties to ISIL are increasingly being subjected to “evictions, confiscations of homes, and other retribution and revenge measures,” said Kubis, adding that Iraqi Prime Minister Haider al-Abadi should take “urgent steps” to stop the attacks, as actions taken against civilians without sufficient evidence violate Iraq’s constitution and international law. Kubis also warned the Security Council that the future in Mosul is “extremely challenging” and stressed that securing the rule of law and promoting development will be crucial in turning victory into stabilization of the just liberated City. ISIL still controls some territory outside Mosul and some bigger areas in neighboring Syria. The UN called on Tuesday for the Libyan National Army (LNA) to investigate alleged torture and summary executions of prisoners by the Special Forces, a unit aligned with the LNA. The LNA effectively controls the eastern part of the country and is expanding into central and southern Libya while fighting with forces linked to the UN-backed government in Tripoli. Last March, the LNA announced that it would conduct investigations into alleged war crimes but has not shared any information since then, according to UN human rights spokeswoman Liz Throssell. “We urge the LNA to ensure there is a full, impartial investigation into these allegations,” Throssell said. Furthermore, Throssell called on the group to suspend Special Forces field commander Mahmoud al-Werfalli, as videos have circulated on social media that allegedly showed al-Werfalli shooting bound prisoners and overseeing torture and summary executions. In response, the LNA has declined comment on the videos. Obstacles have mounted for international aid groups to deliver aid to stranded Syrian refugees near the border with Jordan. In 2016, UN agencies agreed to a controversial aid system that critics say gave much of the control over aid distribution to Jordan’s military and armed forces on the Syrian side. The system has failed repeatedly and only sporadic aid shipments have reached the refugee camps, while rival groups accused each other of diverting aid. Critics say the struggle to provide aid reflects the international community’s wider failure in responding to the Syrian refugee crisis. Around 5 million Syrians have fled their home since the civil war, but countless others are still trapped in the country after neighboring countries like Jordan, Lebanon and Turkey largely closed their borders. “Syria is locked in, and I think this is an issue which is not at all in the public debate or being raised by the aid agencies,” said Kilian Kleinschmidt, a former Jordan-based UN refugee agency official. Countering criticism, Jordan defended itself and indicated that it has absorbed far more refugees than wealthier Western countries, and Islamic militants on the border pose a security threat. A Saudi-led coalition air attack allegedly killed at least 20 civilians in southwest Yemen on 18 July, according to the United Nations and witnesses. Those killed are believed to have been in their homes when the attack took place and the majority of the victims are likely to be from the same family. The UN refugee agency (UNHCR) said in a statement that it was “deeply shocked and saddened” at reports of casualties in the aerial attack and added that the civilians had fled fighting in the nearby Mokha district. “This latest incident once again demonstrates the extreme dangers facing civilians in Yemen, particularly those attempting to flee violence, as they disproportionately bear the brunt of conflict,” a representative for UNHCR said in a statement on Tuesday. Yemen’s human rights minister, Mohammed Askar, described the attack as an “unfortunate incident” and called for a government investigation, while Houthi spokesman Mohammed Abdul-Salam condemned the attack as a “monstrous crime.” The coalition has allegedly bombed civilian gatherings, markets, hospitals, and residential areas across Yemen. The allegations assert that the coalition is responsible for over 8,160 civilian deaths since the beginning of its campaign against Houthi rebels in 2015. Meanwhile, the Saudi-led coalition has reiterated it does not target civilian neighborhoods, despite the accusations by human rights groups. Moreover, the Saudi-led coalition prevented a UN flight carrying staff from an international aid agency from flying to Houthi-controlled areas, according to UN officials. Aviation sources said the flight was blocked because there were 3 BBC journalists on board, and the coalition has advised the journalists to travel on commercial planes since they could not guarantee their safety in rebel held areas, according to Ahmed Ben Lassoued, a spokesman for the UN Office for the Coordination of Humanitarian Affairs (OCHA) in Yemen. “It’s unfortunate and partially explains why Yemen, which is one of the world’s largest humanitarian crises, is not getting enough attention in international media,” Lassoued added.